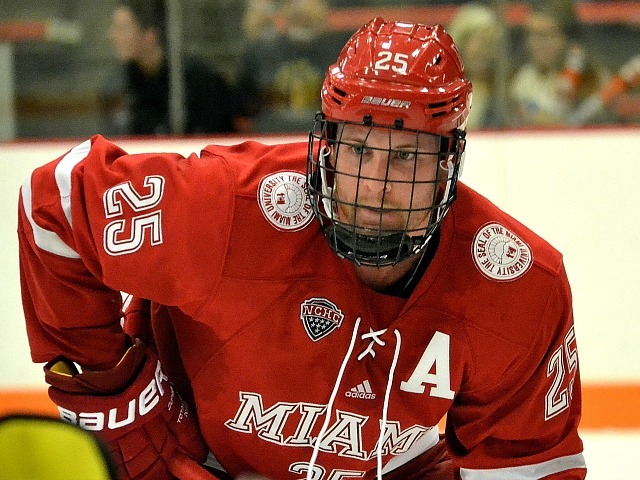 So the biggest question surrounding the Miami hockey team this off-season was: Will Jack Roslovic return for 2016-17? RedHawks players, coaches and fans got their answer just a month before classes started, as the first-round pick of the Winnipeg Jets officially signed with his NHL club on Monday, ending his college career. Here’s how we got to this point. Roslovic was drafted 25th overall by Winnipeg last June. His talent was undeniable, as he turned heads playing for the U.S. National Development team. 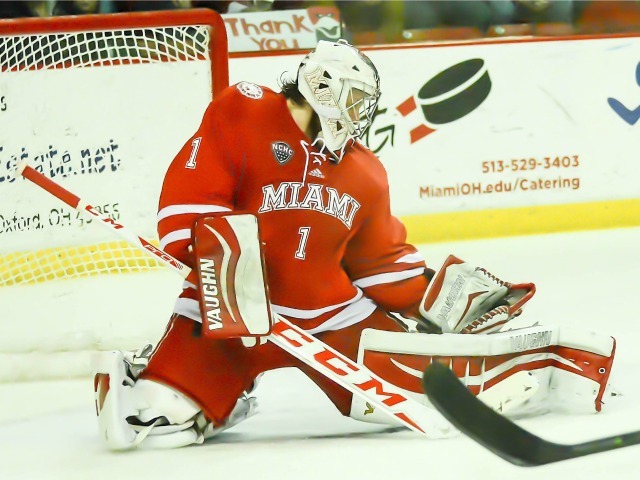 He had maintained that school was important to him, which is a key reason he chose Miami over the Ontario Hockey League, in which Flint (Mich.) held his rights. 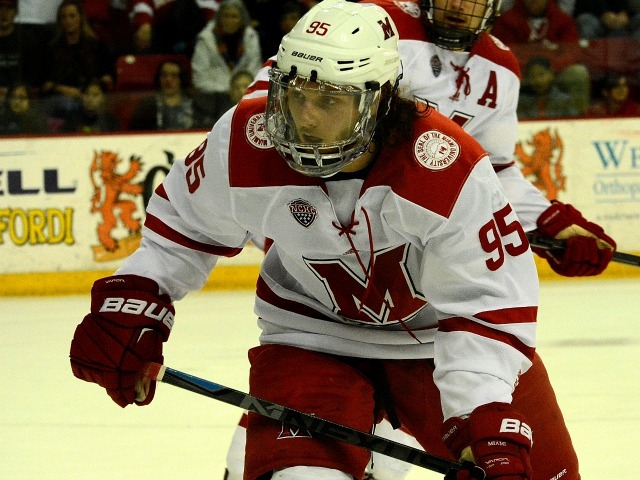 In Oxford, Roslovic scored eight times in the RedHawks’ first 13 games, and on a team that struggled mightily to find the net early in the season, he was a savior. 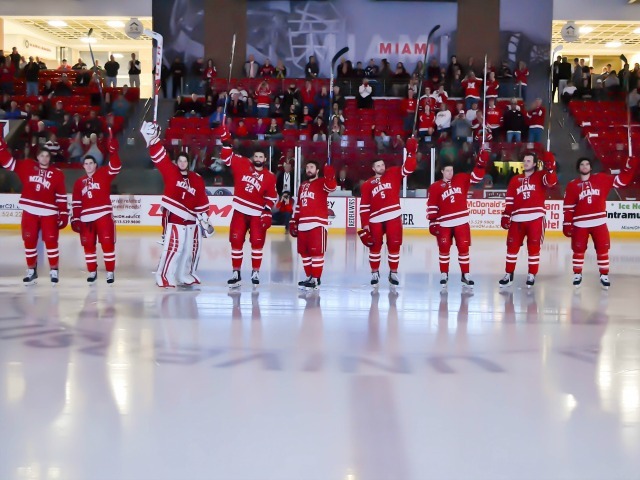 Things went south for Miami toward the end of the 2015 calendar year, which the RedHawks finished 0-5-1. They were swept at Colorado College, the NCHC cellar dweller, in early December to wrap up the first half of the season. Bad things go down when things go badly for sports teams, and the series against CC was nearly a breaking point for Miami. It wasn’t a well-kept secret that Roslovic considered leaving the team at that point, but to his credit remained in Oxford and finished the school year. Defenses adjusted to Roslovic, who found the net just two more times in 2015-16. His defense also left much to be desired at times and he turned the puck over frequently. But keep in mind he was 18 entering his freshman campaign, which overall was an immensely successful one, evidenced by the seven assists he picked up the last 12 games playing on a line with two other Columbus-raised forwards. Fast forward to late last month: The Trade. His OHL rights were swapped from Flint to London, which everyone figured had to happen for a reason. That reason was one part of equation must’ve changed and London now thought it could lure Roslovic north of the border for his fourth juniors-eligible season. Some Canadian media had his departure as a done deal. London has a history of picking off college and would-be collegiate players and is expected to be loaded after winning the Memorial Cup this spring. Also on the pro-London side for Roslovic is the presence of Kole Sherwood, younger brother of RedHawks forward Kiefer Sherwood, who stars for the Knights. But the NHL draft came and went, as did Winnipeg’s camp earlier this month, and Roslovic still had not packed his hockey bag for Canada. This story came out in the Winnipeg Sun two weeks ago, in which Roslovic ultimately indicated the plan was for him to return to Oxford this fall. “We had a good team, there were just a few mishaps throughout the season that bit us,” said Roslovic. “But it was a great time. It’s a great college town. Going to school is definitely not my forte, but I kept up with my grades and had good marks. Maybe not the most PC remark, but he’s 19 and people should respect honesty among athletes. And like he said, he received good grades. By all accounts he had a strong camp with the Jets, but as the days after continued to click by, the odds increased that Roslovic would return to Miami. Over the weekend, however, word started to get out that he had signed, which killed his NCAA eligibility. Personal bias here, but BoB thinks he would learn more about improving his defense and other non-scoring aspects of his game if he stayed. Reilly Smith said as much in his final season at Miami, and look what the Oxford experience has done for him. It probably won’t matter. Roslovic can flat-out play, and all paths likely will lead him to a lucrative NHL career. If he has improved enough, he may stick with Winnipeg (a long shot at this point) or be assigned to its AHL club (a lot more likely) and never see a puck drop with London. Whatever happens after today, BoB respects the incredibly difficult decision this must’ve been for the teen sensation. And whichever team he lands on this fall will be lucky to have him lacing up the skates. BoB would like to wish the ultra-talented forward the best of luck in his professional career and thank him for a fun season. We just selfishly wish we could’ve seen a couple more years of him. WHO: No. 3 St. 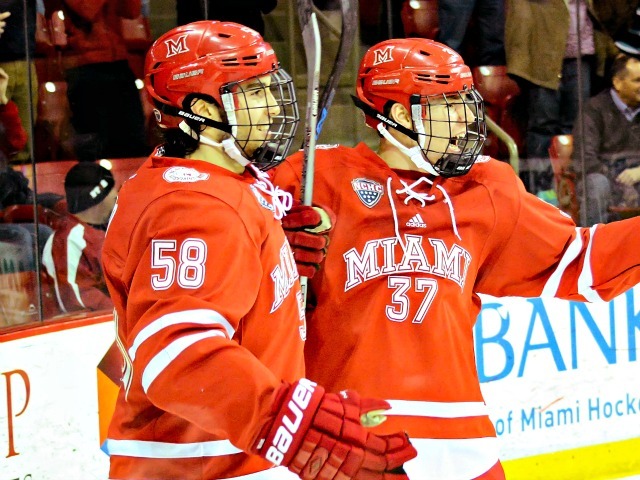 Cloud State Huskies (22-5-1) at Miami RedHawks (10-12-3). TV: Friday–Fox Sports Alternate (DirecTV Ch. 608); Saturday–None. ST. CLOUD STATE RADIO: Both nights–KCML-FM (99.9). NOTES: St. 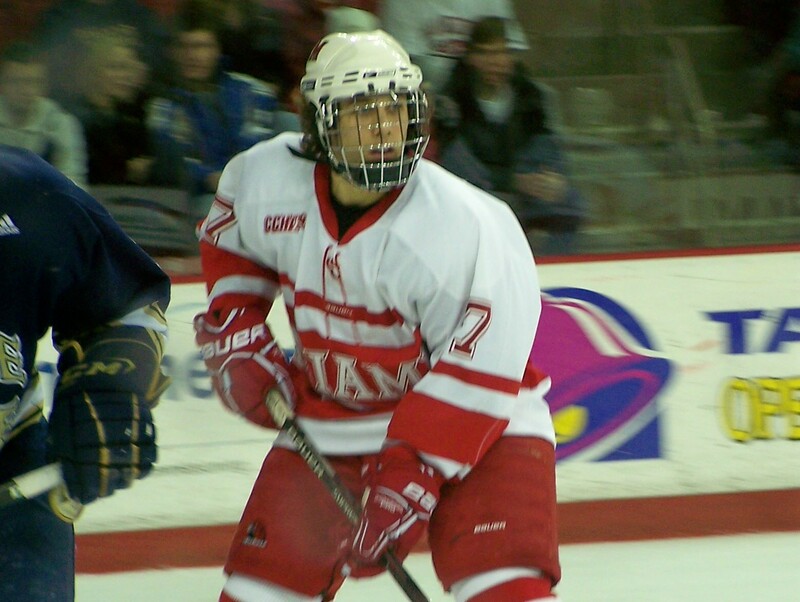 Cloud State has 123 goals or 4.39 per game, the second-best clip in college hockey. The Huskies have eight players with 20 points or more, compared to Miami, which has just one (Jack Roslovic), and six SCSU skaters have scored at least 10 times. Kalle Kossila has 11 goals and 24 assists for a team-best 35 points, and Joey Benik leads the team in markers (17) and is second in helpers (16). Rounding out the team’s 30-point club is David Morley with a line of 10-21-31. Captain Ethan Prow leads all blueliners in points with 26, including five goals. In net, Charlie Lindgren leads all of college hockey in wins (21) and minutes (1,562). He has a 2.04 goals-against average and a save percentage of .927. St. Cloud State is second in college hockey with a power play percentage of 31.7. If the Huskies have an Achilles’ heel, it’s their penalty kill. Opponents are converting 22.8 percent of their chances on the man advantage. SCSU is riding a six-game unbeaten streak and has won four in a row, during which the team has scored 25 goals. 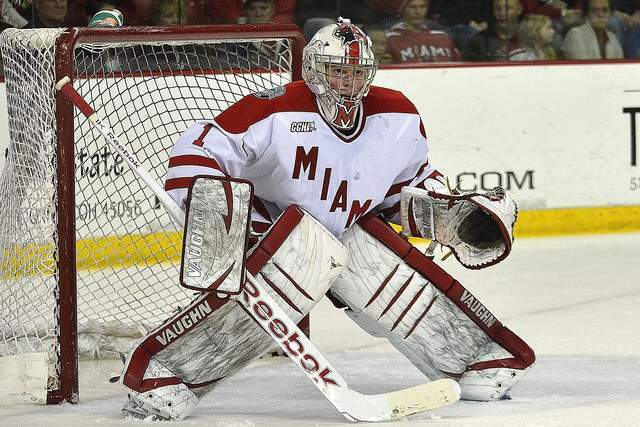 Miami leads the all-time series, 13-9-2, but has lost four of its last five meetings. This is the first time these teams have played in Oxford since Feb. 21-22, 2014. The RedHawks have just one more home series after this weekend. 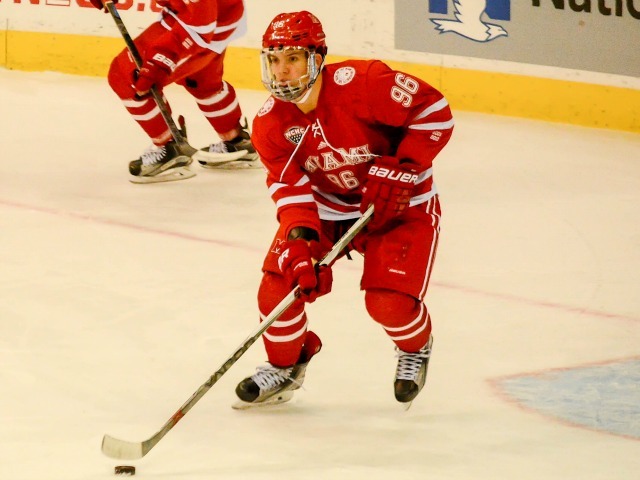 OXFORD, Ohio – The better team won both games this weekend at Cady Arena. Unfortunately for Miami, that meant after winning the series opener against Denver, the RedHawks fell to the Pioneers, 5-3 in the finale on Saturday. The strange thing about Game 2 was Miami was badly outplayed in the first period but came away from that frame with the lead. The RedHawks were much improved in the second and third periods but were outscored in both. Typically in the ultra-competitve NCHC, teams splitting against a ranked in-conference team is OK, so long as they are beating the bottom dwellers. The problem for Miami is it dug itself such a deep hole that 1-1 weekends are no longer suffice if it hopes to get back into NCAA Tournament contention. 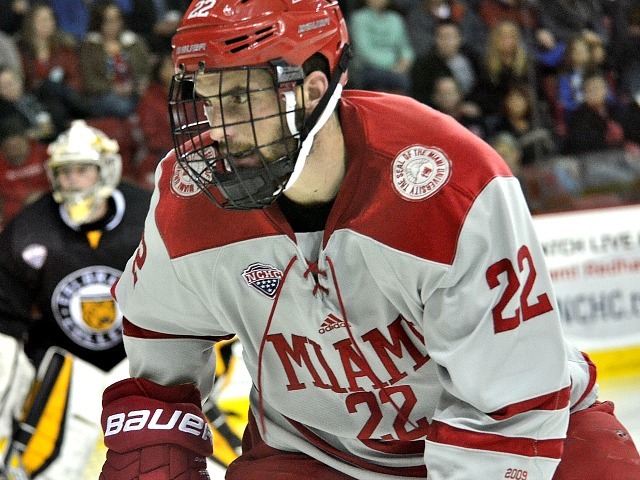 At 24th in the PairWise, the RedHawks still have much work remaining before any serious NCAA talks can begin. And Miami now will play the majority of its nine remaining games away from Cady Arena. As mentioned before, strength of schedule will help Miami if it gets to .500 or above, but one caveat as we move forward: The NCAA now requires teams to post at least a .500 winning percentage to qualify for an at-large bid. But judging from its positioning in PairWise (24th) vs. its record (two games under .500), this looks like it will probably be a self-policing situation. Just wanted to throw it out there. A 6-3 finish to the regualar season would suffice the winning percentage requirement, assuming Miami can win at least one in the best-of-3, and there’s a good chance that in that scenario that series would be played in Oxford. It may take a 7-2 mark plus a trip to Minneapolis to get into the top 14 in PairWise, which is probably where Miami would need to advance to for a fairly safe NCAA berth. 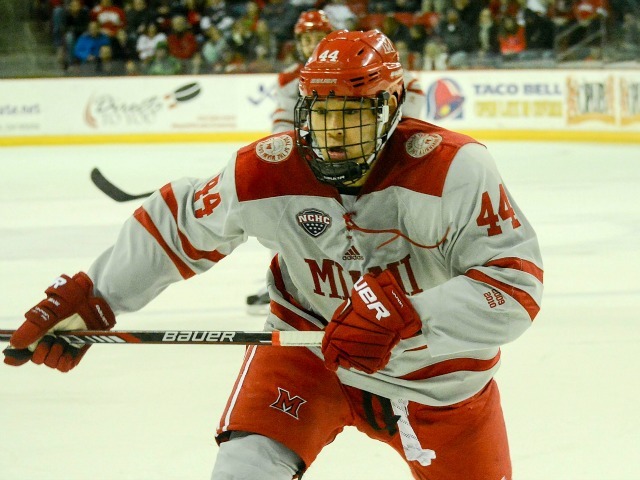 The RedHawks’ small margin for error makes next weekend so important and such a high-risk, high-reward series, since wins will be tough to come by against the second-ranked (in the PairWise) Huskies but could be very lucrative. – Back to the game…too many turnovers, especially in the first period when Miami seemingly was essentially in penalty kill mode for 20 minutes. Forwards didn’t seem to get back on D or backcheck very well, and after standing on his head for the first four periods of the weekend, senior goalie Jay Williams led in a couple of outside shots he normally stops. The flip side of that is: Denver is a very good team that played a very good game in most facets (goalie Tanner Jaillet wasn’t that great would be the only knock on the Pioneers in this one). – Jack Roslovic’s set-up of Kiefer Sherwood was world class and was shown repeatedly on the big screen, as it should have been. A world-class play by a world-class player. He still needs to stop trying to carry the puck through three and four players, which he was probably able to get away with at the last level. – Obviously skaters cannot record saves, but both Alex Gacek and Chris Joyaux kept pucks from going into the net by sprawling across the crease. Great effort by both on their respective “saves”. – Our nightly GoalieGate update: There is no update. Ryan McKay was scratched again on Saturday, and it’s unknown if/when he will return. One thing of note regarding goalies: Ryan Larkin is with the team but is recovering from an upper body injury and is out for the season. 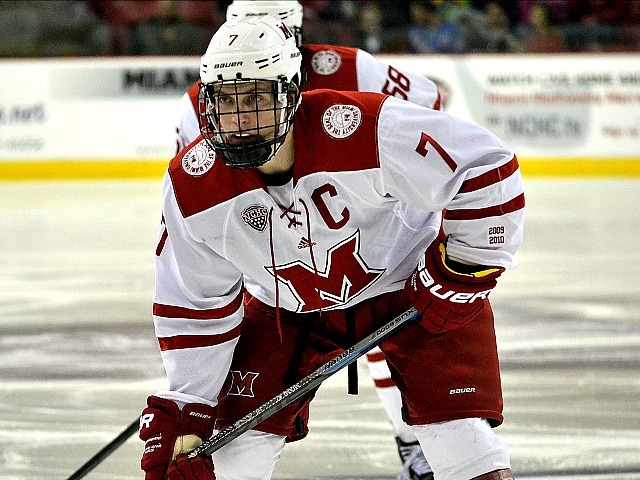 Larkin, the cousin of Detroit Red Wings star Dylan Larkin, came to Oxford earlier this month to start on classwork and will be a freshman this fall. Good move by him and by the program. FORWARDS: C. They scored all three goals, but as mentioned above, the backchecking and defense by this group left much to be desired, and they turned the puck over way too much. Nice to see the Roslovic-Sherwood combo generating offense as well as Kuraly scoring by driving the net. So glad to see Alex Gacek having a solid senior season. DEFENSEMEN: C. Kind of a comme ci, comme ca game for this group. No standouts for either good or bad reasons. It does bear mentioning that Louie Belpedio has been much more solid overall since returning from Finland. GOALTENDING: C-. Tough call here. Williams was the difference in the first period but was 16 of 21 the final 40 minutes. To be fair, he had zero chance on the first goals, and on the fourth one Shore ended up with puck all alone in the slot for multiple seconds after an unfortunate bounce for Miami. And Williams made the initial save on the third goal. The second and fifth ones were two he would’ve wanted back, but the fifth one was a laser that found the top corner of the net. LINEUP CHANGES: None again. This is the fifth straight game Coach Enrico Blasi has gone with these 18 skaters plus Williams in net.